This was the first issue for 'Space is The Place'. Recorded October 19th 1972 at Streeterville Recording Studio, Chicago, Illinois. Mixed at Village Recorder, Los Angeles, California. Gatefold inner cover contains poems from the book "The Immeasurable Equation" by Sun Ra. This is one of those Free-Jazz albums I can only listen to when I'm in a certain mood. I don't 100% like it but I listen to mainly because it's Sun Ra and it represents a good point in Impulse's history. I think. The title track is a great 21+ minute piece featuring a large barrage of different instruments happening at once. It settles for a bit and then kicks up again. This occurs about 3 times during the track. 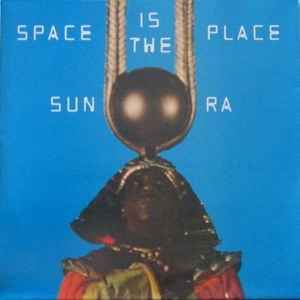 The think I like most about is Sun Ra's own Organ play, making the high pitched "Space Laser" sounds. It just puts you more into the mood. The other 4 tracks are fairly different. Images could have been pulled of a Coltrane album and most wouldn't have notice. I personally love how this album ends with the track Rocket Number Nine. An awesome short piece that take you back home. It sounds a bit comical too. I am very picky when it comes to free-jazz and although I don't like this album as much as some others on Impulse it always gets played simply cause it was a personal turning point in my jazz collection.